It was August of 1915 in Accord, New York when hay fever and asthma struck my mother, Sarah Herskowitz, full force. She was confined to her bed from August to November. After seeing many doctors and having many allergy tests, it seemed hopeless. She got worse every year and after a terrible bout with pneumonia, a very compassionate doctor advised my mother to go to the White Mountains. Where were the White Mountains? Nobody seemed to know. We were very poor and my mother told him she could not afford to go. “Even if you have to walk and live in a barn, you must go,” he advised. It was August 1924 when we saw her off at the Grand Central Terminal in New York. When she arrived at the Littleton, N.H. railroad station, Max Glantz, who was a taxi driver and owned a rooming house in Bethlehem, approached her and asked her if she was looking for a room. She was in a strange town knowing nobody and knowing of no place to stay. She went to Max Glantz’s house and rented a room for the following six weeks which was the duration of the hay fever season. Mr. Glantz, a Jew and a New Yorker had also come to Bethlehem to seek relief from hay fever. His vocation in New York was in the printing field. Unable to work during the hay fever season, he came to New Hampshire and earned his livelihood renting rooms and driving a taxi. I believe his was the first Jewish rooming house in Bethlehem. It consisted of one dining room, one kitchen, about two or three ice boxes, two toilets and one bath. Each roomer had to make reservations for a bath as there was not enough hot water. The roomers were all from New York suffering with hay fever and asthma in its worst form. These were people who were choking, wheezing or sneezing in New York, making their life impossible to endure, and who were getting almost complete reliefin Bethlehem. They left their husbands and children for those six most critical weeks, giving up the conveniences of their own homes and apartments to live among strangers who couldn’t understand this invasion from the big city. The scenery and the mountains were breathtaking, and the air was pure, but their minds and hearts were home feeling guilty that their working husbands and children were coming home every evening from hot offices and factories to an empty house with no mothers or wives to greet them and no meals prepared. My mother was in her early 30’s but bent over she looked like a woman of 75. We couldn’t believe the improvement when we came to visit her. I loved the New Hampshire cool, clean air and remember saying as I stood on the porch, looking at the beautiful scenery, that when I grew up and got married, I would come to Bethlehem every summer. Weren’t we in America, the Land of the Free? We didn’t need a passport, so why not ? My mother occupied a corner room downstairs as she could not climb stairs. On the upper floor was Mrs. Pashkovsky and her two daughters, Dora and Sylvia who had also rented a room. Dora was about my age and so I had a friend. Mrs. Pashkovsky is now my neighbor in the Bronx and until she moved to Co-Op City with central air conditioning in every room, she came to Bethlehem every year. 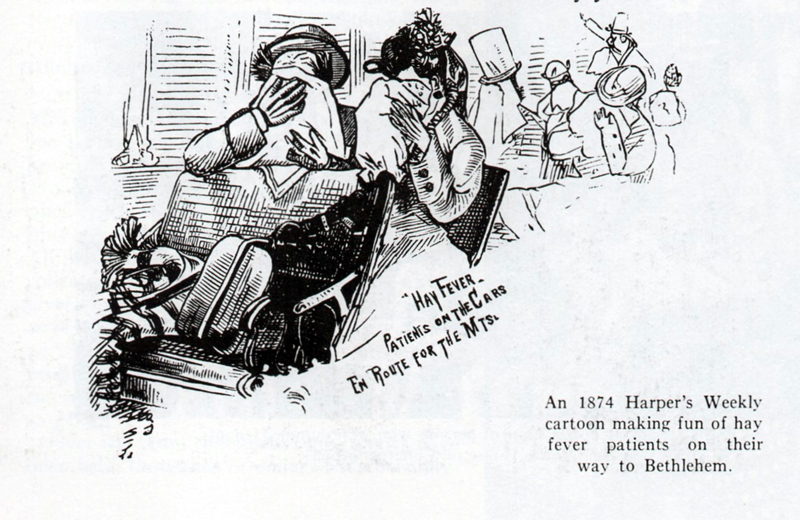 An 1874 Harper’s Weekly cartoon making fun of hay fever patients on their way to Bethlehem. Now that my mother was improving so well, she began to look for a house as an assurance for her old age. She was frightened at the thought of not being able to afford a summer in Bethlehem. In October of 1934 she bought the Jellison house on the corner of Congress and South Streets, called the White House. It had been rented to a Jewish family from Boston who ran it as a boarding house. My mother continued to call it the White House and started renovating and remodeling the residence. One Spring, while in New York in the month of May in the early l930’s, my mother was again struck with asthma worse than in August 1915. This was called Rose Asthma. She lay with ice bags on her heart in bed gasping for breath, coughing, and wheezing. Now that she owned her own house, she could come any time of the year. We took her to Bethlehem post haste. Lo and behold, she got better relief in May and June than in August. She was painting, wallpapering, cooking, and baking in the months of May and June. By word of mouth, more young women with children learned of Bethlehem and the White Mountains. The poorer ones rented houses from the natives for the summer. The more affluent Jews, after coming to the hotels now owned by enterprising and hard working Jewish families, found that here in Bethlehem they could live and breathe, and started purchasing cottages. I remember many people and families such as the Honorable Judge Jonah Goldstein of New York, who died in the Littleton Hospital a few years ago. He was very active in the Jewish community, hay fever home, and in the synagogue. His daughter, Beatrice, wife of Jules Gordon, was president of the Sisterhood for several years. Mr. and Mrs. Jacob Licht, proud parents of the Honorable Governor of Rhode Island, owned a cottage on Jefferson Street. They were also active in the synagogue and the hay fever home. Mr. Licht, now deceased, was exceptionally active in the Sisterhood. There were Mr. and Mrs. Nizer who owned the house on Strawberry Hill, parents of the now famous Louis Nizer who wrote the book, ”My Life in Court .” Louis Nizer presented their house to the synagogue in memory of his beloved parents to be the residence of our spiritual leader and his family, Rabbi Seymour Brickman. Another family that came to Bethlehem were the Heifers of Chelsea, Massachusetts. They were very enterprising and an active family in the community. They also came because of allergy in the family. They started selling fresh fruits and vegetables, then bought out the Sanitary Market which is now the Quality Market on Main Street. They then opened up the first fish market. I remember their daughter, Bertha, who died at the age of 29 at the Littleton Hospital. She was married to Sam, who later took over the Quality Market. I also remember the Heifers’ handsome son, Irving, who always helped his parents. He was killed in World War II. Ruth Heifer Monsein, another daughter, wife of Abraham, has a cottage on Pine Wood Avenue and also resides in Hallendale, Florida. There is another son, Dr.Heifer, who met and married the daughter of the owner of the one-time Strawberry Hill Hotel on Main Street. Mr.Heifer now owns the antique shop on Main Street. About 1925, Mrs. Nathen Basin came to Bethlehem and after many years, Mr. and Mrs. Basin bought their own little cottage on Jefferson Street, which they sold two years ago when they moved to Miami Beach. Nathen was very active in the synagogue and Mary was active in the Sisterhood. 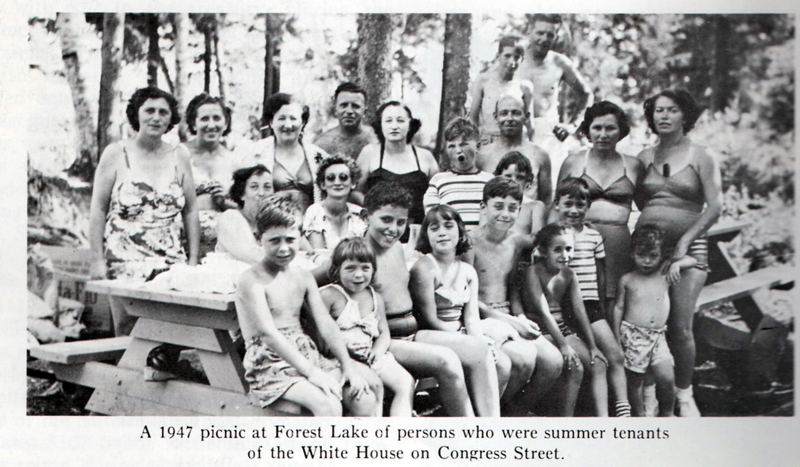 A 1917 picnic at Forest Lake of persons who were summer tenants of the White House on Congress Street. Statistics have revealed that about 10% of the population of our country suffers from some major form of allergy. Allergic diseases may involve any part of the body, and the systems most frequently involved are respiratory which include hay fever and asthma. Hay fever is caused by an allergy to the pollen of trees, grasses or weeds. The sufferer has paroxysms of sneezing, itching and weeping eyes, running nose, burning palate and throat. Nose, throat and ears may become infected, nasal polyps are made worse, and asthma is often a serious complication. Asthma is a condition characterized by coughing, wheezing, and difficulty breathing, and is usually associated with a family history of allergies. Asthma may begin at any age and if neglected, becomes chronic and serious. The condition is made worse by emotional reactions to strain. Fortunately, it has been ascertained that the vicinity of Bethlehem, a pollen-free area, is of profound help in combating these ailments. Recognizing the need for affording relief to indigent sufferers of these allergies whose every breath may be a torture during the Hay Fever season, the National Hay Fever Relief Association came into being. The idea of concerted action had to come from the ranks of the sufferers themselves, who were a group of dedicated philanthropic men and women who obtained relief from their afflictions at Bethlehem. It was during the summer in the late 1920’s that a meeting of involved individuals was held in Bethlehem supplemented by intermittent work in New York City. Funds were obtained to cover the cost of a 100-acre unencumbered farm with facilities suitable for the admission of indigent allergy sufferers. Dr. Herman Blum (left ). 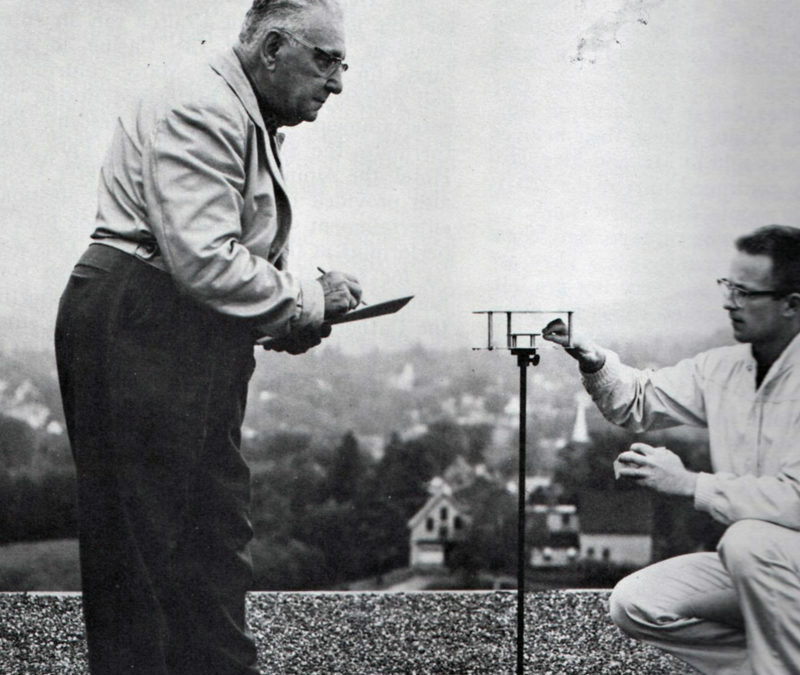 research director of the National Hay Fever Relief Association and Richard Daley, a science teacher at Littleton High School, examining a ragweed pollen exposure slide on the roof of the Littleton Hospital. Dr.Blum, who passed away in 1973, spent many summers in Bethlehem and did much to encourage the scientific study of hay fever. He is also the author of The Loom Has A Brain, a book about the history of weaving. The Association has progressed gradually and now points with pride to the construction of several new buildings, two artesian wells, a water drainage system, a recently constructed recreation hall as well as a modern camp for underprivileged allergy children. All necessary equipment and recreation facilities have been provided for the convenience and health of these needy victims. The home­like atmosphere maintained has evoked unbounded praise and gratitude on the part of the needy recipients, thus making it a haven for them. It is through the dedicated work and efforts of our officers, directors, membership and numerous philanthropic and community leaders that the National HayFever Relief Association was able to function so effectively throughout the years. Dr. Herman Blum ranks among the top leaders. 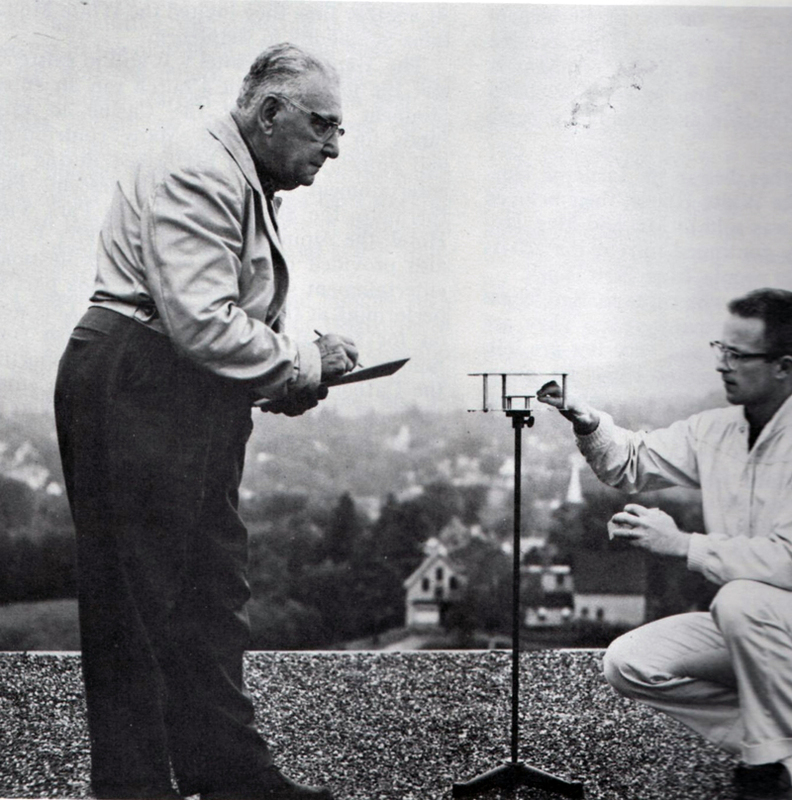 As research director of the Association, Dr. Blum’s major activity, which received wide acclaim, was his inauguration of a pollen counting survey in the White Mountain region. Commencing with one station located at the Institution, this activity has expanded to many stations and is one of the most important publicity mediums in New Hampshire, giving authentic scientific information on the incidence of ragweed pollen in the White Mountain region. Thus, through the kindness of the more fortunate, the sick, the weak and the poor are returned to better health. In 1973 officers of the National Hay Fever Relief Association were: Jacob Licht, President; Dr. Herman Blum, (who died in the Spring of 1973), chairman of the board and research director and operator of five pollen counting stations in the White Mountains; Sol Ash, executive vice president ; Mrs. Dorothy Rubin, treasurer; Jonas Leisten, secretary; Miss Sarah Masor, executive director. Headquarters in New York, 401 Broadway,10013. The Constitution of the United State Hay Fever Association. Organized in Bethlehem, N.H., September 15, 1874. Article 2. Its object shall be mutual benefit and the seeking for information which shall serve to relieve all sufferers with Hay Fever, wherever found. Article 3. Any person afflicted with Hay Fever, or Rose Cold, may become a member of this Association, by signing the Constitution. Article 4. The officers of this Association shall consist of a President, Vice-President, an Advisory Board, a Treasurer, Corresponding Secretary, and Recording Secretary. Article 5. It shall be the duty of each member to report to the Recording Secretary the discovery of any remedy,source of relief, or exempt district which may come to his or heer knowledge during their natural life. Article 6. The Secretary, on receipt of such information, shall apprise each member of the Association, at their last and usual place of abode. Article 7. Honorary Members may be elected at any meeting of the Association. September, upon the call of any six members of the Board of Government. Article 9. This Constitution may be amended at any annual meeting, by vote of the majority present. Voted, Sept. 3, 1875, That each member be assessed one dollar oer annum. The meeting for 1876 will be held in Bethlehem, August 28.